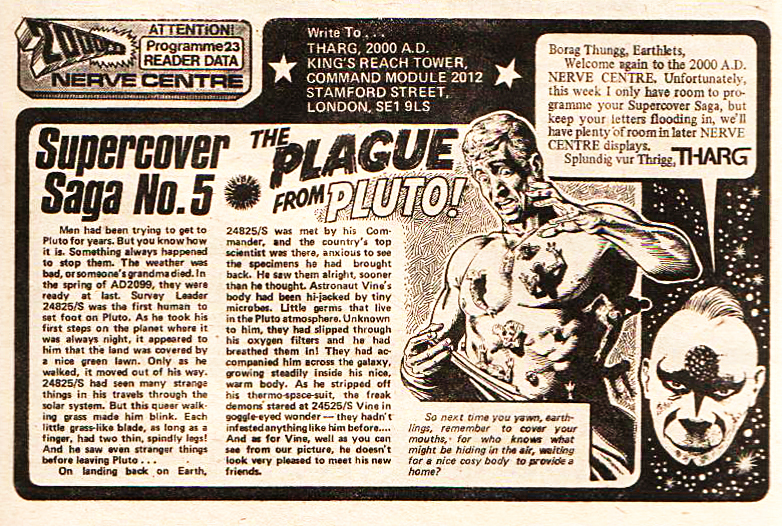 2000AD comic Prog #23 (30 July 1977) | 'TAIN'T THE MEAT… IT'S THE HUMANITY! I’ve been looking through my old issues of 2000AD, the long-running weekly British sci-fi comic, picking out my favourite covers and came across this gem from July 1977. This is in response to me reading The Art of Judge Dredd, a hardback that collects covers from 2000AD featuring that title’s most popular character, Judge Dredd. While reading the collection I thought it a shame that the book chooses to concentrate only on the future lawman. During it’s nearly 40 year publication history 2000AD has published almost 2,000 issues and many of the non-Dredd covers are terrific. So I’m going to spend the next few weeks digging through my collection showcasing some of my favourites. 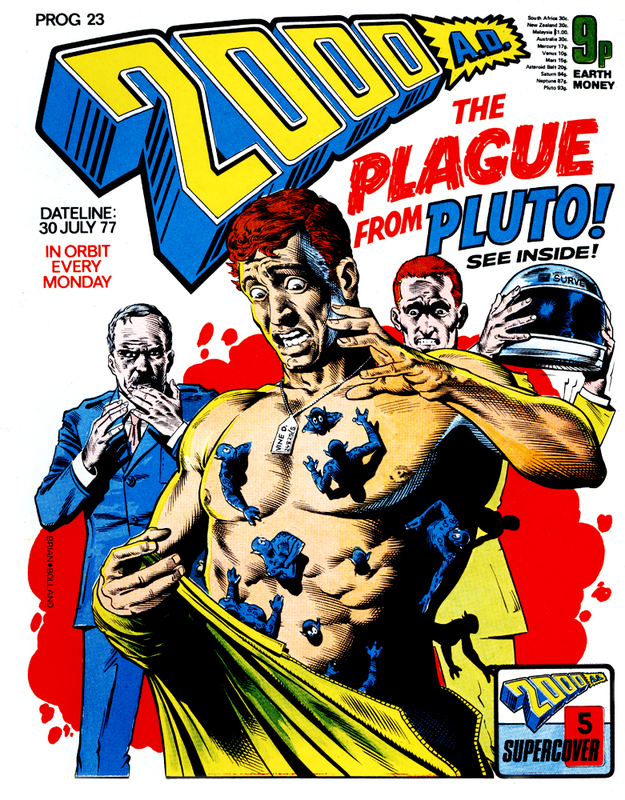 The cover to 2000AD Prog 23 (dated 30th July 1977) featured artwork by fan-favourite Brian Bolland who illustrates The Plague from Pluto. 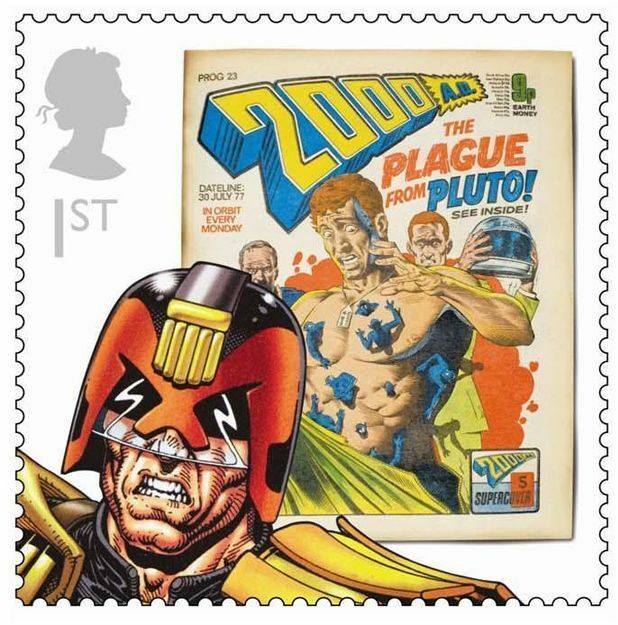 Unlike the majority of 2000AD’s covers this story isn’t backed by a strip inside the comic, but was instead part of a series of covers labelled ‘Supercovers’. There were 25 of these covers (of which this is no.6) and they were all based on a short text story that appeared on that issue’s Nerve Centre page. Clearly meant as an experiment to attract new readers by featuring outlandish and eye-catching covers the idea was soon dropped and from then on all of 2000AD‘s covers showcased one of the regular strips. However, it’s the over-the-top sci-fi elements that make this cover so appealing, and Bolland perfectly captured both the terror and craziness of the story. By Prog 23 the artist had already contributed half a dozen covers to the fledgling anthology comic and this one is by far the strongest. Over the next decade Bolland would develop into one on the industry’s strongest cover artists and signs of that skill are in ample evidence here. His artwork is simple, bold and striking –everything a good cover should be. And the rest of Prog 23 isn’t half bad either. The issue kicks off with another instalment of the Bill Savage vehicle Invasion! Future sports strip Harlem Heroes follows along with killer polar bear Shako. Dan Dare gets the coveted full-colour centre spread while Six Million Dollar Man analogue M.AC.H. 1 and Judge Dredd round off a memorable issue. I have a few more eye-catching covers from 2000AD and I’ll be posting them in the next few weeks.